iPhone photos can be printed surprisingly large, depending on the print format and viewing distance. Our app Print Studio offers photographers a variety of ways to professionally print iPhone photos and have them delivered to your door. 1. Download Print Studio (for free!) from the App Store. 2. Select a product from our curated line-up: e.g. Prints, Greeting Cards, Stickers, Frames, Metal Prints, etc. 3. Allow Print Studio access to your photos. A pop-up should appear. If not you can allow access under Settings > Privacy > Photos. 4. Select your photos for printing. Print Studio can access any albums on your device or in your iCloud, as well as your Instagram photos. 5. Crop, edit, and perfect, with the in-app editing tools. 7. Enter your shipping address: we ship anywhere in the world! 8. Check out. We accept all major credit cards and Apple Pay. 9. Check your mail: US shipping takes about a week, International takes 2-4 weeks. 🤔 Which photos can I print? With Print Studio you can print any photos you can access in your iPhone's photo library, including all Albums, Moments, iCloud, as well as your Instagram photos. 📐 How big can I print an iPhone photo? Photos taken on an iPhone 6 or earlier are 3264 x 2448 px and we can print these up to 20" x 30". Photos taken on a 6s or later are 3024 x 4032 px and we can print these up to 30" x 45" as our largest print: The Wall Filler. 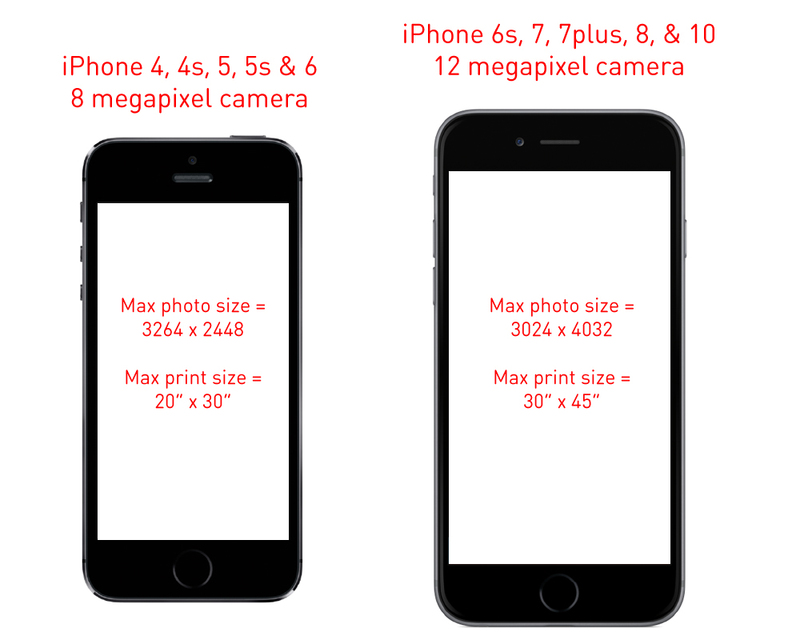 Some sites and services recommend that you don't print iPhone larger than 16" x 24", but really this depends on viewing distance. If you print an iPhone photo at 100dpi (30x40 inches) and look at it from 3 feet, the resolution looks as good as a 16" x 24" print at close quarters. 🤳 How big can I print a selfie? 📸 What about Instagram photos? Our app can access and print your Instagram photos. We have a variety of products design just for them, like our Square Prints, Photostrips, and Posters. Because Instagram compresses photos after you upload them, the maximum size we can print Instagram photos is 5" x 5". 💃 Can I print live photos? Yes! If you select a live photo to print, we will print the still you see before you force-touch to animate it. 🗺 Can I print panoramic photos? Yes! We offer a 12" x 36" print size designed just for panoramic photos. We can print these on Paper, Metal, and Wood. Print Studio is our much-imitated beautifully-designed app. We were one of the first iPhone and Instagram printing apps and we've been perfecting the software for five years now. Our app has been featured many times in the App Store, we have over 2,000 five star reviews, and we do all our printing in California. We're a small independent company with no outside investors and we answer to no one but you. 💻 Can I print iPhone photos from my computer? Yes! If you don't want to use the app, you can always use our website Social Print Studio. Just access your iCloud on your computer, then drag and drop images onto our website. You can also airdrop the photos to your computer over your wifi.